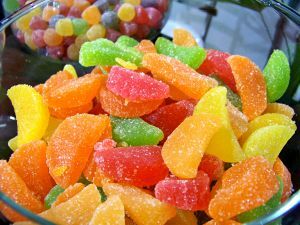 Live For Food » Blog Archive » How much sugar should I eat? Sugar is in so many of the foods we eat. It’s in the obvious foods like cake, chocolate and pastries, and it’s also hidden in many foods like ready meals and breakfast cereals. Sugar comes in many forms. Sucrose and glucose are types of sugar you will see on your chocolate wrappers. There is also fructose which is found naturally in fruits and lactose which is found naturally in milk. So you may ask, what is the recommended daily amount (RDA) of sugar? Well, technically an RDA is the minimum of a particular nutrient that you need in the body, and as we don’t actually need sugar to live the RDA would be nil. Sugar does give us energy but there are many other foods which give us energy in a more efficient way. The only people who may need sugar for instant energy are athletes. A bit of browsing reveals that there is no set maximum recommended allowance for sugar either. I have seen levels for women estimated between 25-90g a day, and for men 38-120g a day. In terms of calories that is 100-360 for women, and 150-480 for men. Quite a wide range! The US government makes a broad recommendation based on sugar consumed being no more than 8% of daily calorie intake. For a woman eating 2000 calories and a man eating 2500 this comes out as 40g and 50g respectively which seems reasonable. To put this into context, a medium banana contains 14g of sugar, a medium chocolate chip cookie contains 20g, and a Mars bar contains 35g. A product containing over 15g of sugar per 100g is considered to be high in sugar, and less than 5g per 100g is low sugar. Shockingly many boxes of breakfast cereal are high in sugar. If you tot up all the hidden sugars you eat as well, it would be quite possible to be over the suggested limit by the end of breakfast. All I can say is that I wish sugar didn’t taste so nice! Nice post. Sometimes I wonder if I should be paying more attention to my sugar intake. But, usually I decide it’s not worth it. I try to limit added sugars (who needs the extra empty calories) and find that works pretty well for me. I am sometimes astonished by the amount of sugar that is added to some food products that I think could do with no added sugar. Yes the added sugars are more shocking because you don’t expect them to be there. When you eat a doughnut at least you know you’ve made a conscious choice to eat a pile of sugar. I find it difficult when I am cooking fruit for a crumble. My favourite cooking apples for flavour are Bramleys, but I need to add quite a bit of sugar to be able to eat them. If I use Golden Delicious for cooking, I don’t need the sugar, but the flavour is not the same. How to choose?